Beaucoup Fit Personal Training and Performance Enhancement: Let's call this one "FAT LOSS 101"
Let's call this one "FAT LOSS 101"
The first thing I hear from most people when they hire me to train them is that they want to lose weight. While this is good, I find a more ideal goal is to decrease body fat and to increase muscle mass. I say this because two people can weigh the same weight but have body compositions that are completely different. And though you can't control the height you were born with you can affect your body fat percentage. 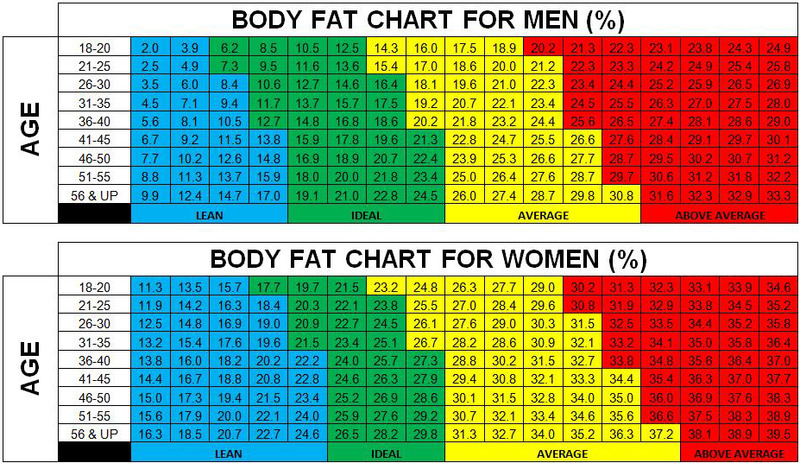 That being said, let's talk a little about body fat. 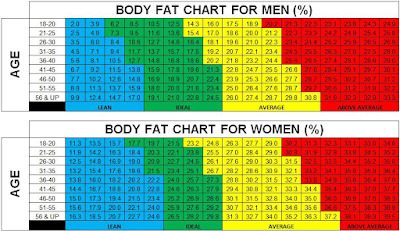 Above is a chart of the agreed upon standards for bodyfat according to age, and gender. There are a number of ways to calculate your body fat but for the lay person all we really care about is the eye ball test. How do I look with my clothes on or with my clothes off, especially if it is SUMMERTIME AKA BIKINI SEASON! Below are some figures are various body fat levels so you can compare yourself to the different figures to get a rough estimate into which group you below. 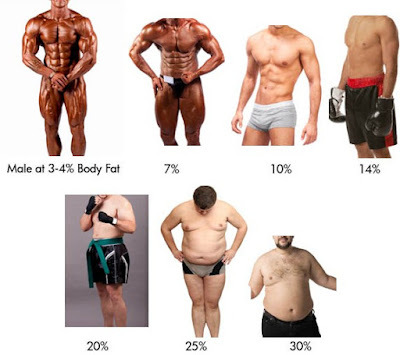 It is important to note that while being 3-4% B.F seems like a good goal if you are a man or 15% or below if you are a woman, it is extremely hard on the body to stay still lean for any extended period of time. Body builders and fitness models typically peak to these levels for their photoshoot/competition and even this is achieved by limiting water intake and manipulating their bodies through carb depletion. Hormonal levels can be negatively affected and multiple health issues may arise as well. So back to the Majority of Society: I just want to look better than I do now! I'll start with exercise. If you are not exercising START! It doesn't have to be Insanity for you to start seeing results. Start at 10-15minutes of activity and gradually increase until you can do a half hour to an hour. Not everyone can go balls to the wall like I do so you have to know your lane and stay in it. But with time and consistency you will get better. I recommend not just CARDIO but WEIGHTLIFTING AS WELL. Afterall, you want to increase the lean muscle on your body. And carrying more muscle makes your metabolism work harder to sustain it thus aiding in fat loss. We have all seen those marathon runners who are in great shape but look like if you pluck them too hard they will fall apart. Though they don't have the body fat some look fragile which I do not feel is an ideal look either. Or you see the runners who do cardio cardio cardio but still appear skinny fat. Again, the goal is to strive for balance. So as I said, make sure you are doing both and when I say weightlifting, bodyweight exercises qualify as well. Pushups, Bodysquats, Burpees, Mountain climbers are all great. Now we dive into the hard part. Diet! If you are like me you can workout and workout but it is fighting the cookies, cakes, and pies which is the hard part. Here is where good habits come in. My 1st recommendation is to get it out of the house. You will not win over your temptation. No matter how long you deny it, the second you stay up past 11pm, those cravings will attack you and you will give in. Start loading the house with healthy substitutes. Fresh in season fruit are great options. Frozen fruit can be a good candy deterant as well. If you like chips and crackers try substituting with nuts, air pop popcorn and/or rice cakes. Is soda your weakness, try mineral water mixed with agave nectar. I address this first because most people know to avoid the fast food, but it is the snack cravings that bring them down. As far as healthy eating...there are so many ways to skin that cat. Try to avoid starchy foods as much as possible instead indulge on protein, healthy fat, and fiberous carbs. Better eating habits mixed with increase workload will definitely lead you to lower body fat percentages. Just remember, it takes time and consistency. You didn't gain weight overnight so you won't become beachbody ready overnight.